Yet another fantastically heretical Easter Sunday conversation, albeit this time by text with my favorite Jewish doctor. Drew: Are you done with that whole chocolate egg thing that your people pretend is connected to Jesus, yet. Me: The kids were done hours ago. Now they’re Skyping with their father. Drew: Oh great. Is he correcting your parenting from afar, again? Me: He’s telling them, to tell me, to email him their report cards, and I’m biting my tongue from saying, “Sure, but tell him to send child support”. Drew: Well, he might actually do it! It is your people’s day of miracles, after all. Me: I’m pretty sure that we used all of our miracle cache on that resurrection thing. No dice. Drew: If he does, can we say he “rose from the deadbeat”? Me: I love you so much right now. Right!? He cracks me up…and he’s mean…perfect combination. There are too many funny things to comment on so I’ll start with my love for JD’s ‘your people’ and finish with ‘He rose from the deadbeat’. Oh, just realized that neither one of those comments were yours. Whoops – I guess we’ll give you credit for the typing part? I just read your latest posts and laughed to the point of tears. Your kids funny as all get out. I love how the fathers who don’t see their kids often think they are SUCH amazing parents that they can criticize the fact that WE are here every day, don’t get time outs just to make sure our kids are happy and healthy and they can’t be bothered to send support. My ex demanded I buy my son a phone so he can call him when he wants to. Because a phone for one call a month is worth it. right? He wont get one for him though. Thats my job. :eyeroll: Or I don’t know support your child so I can. High 5 for your friend, man is a riot! Wait…do we have the same ex!? Are we sister wives!? It’s like these guys all follow the same pamphlet. I’d tell him that you think he’s funny, but it will give his giant head even more swell. He amuses the crap out of me. We’ve been friends for over twenty years, so he knows ALLLL the dirty. I pray you haven’t met my ex. I think sister wives would be awesome but I have a problem sharing my hubs with the couch (bad back) lately so I doubt I’d be the best woman to be adding in the family lol. it’s always nice to have someone like your friend around. I bet he keeps life interesting! Thanks for stopping by. I was praying for the miracle of child support to end up in my Easter basket too. 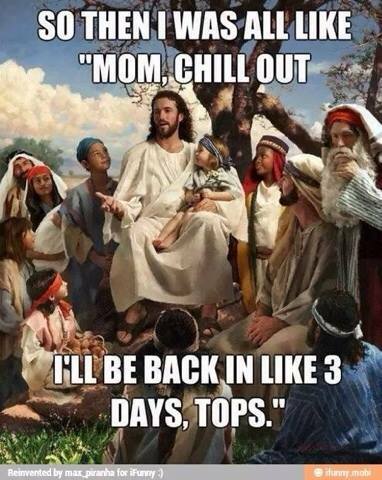 Needless to say, Jesus was busy that day, but Mother’s Day is right around the corner! Ditto, etc., (wouldn’t want to swell your head by overpraise, you extremely talented and funny person) but really writing ’cause am thinking if you hadn’t yet read “Lamb: The Gospel According to Biff, Christ’s Childhood Pal” by Christopher Moore, you might be awfully glad someone included the link below to the first page after the Prologue. Equally respectful and disrespectful, deadly funny, and in parts brilliant. One of my favorite books of all time!!! The most witty, profane, and yet spiritually beautiful things ever written. A work of absolute genius! Ah–sorry–I see Amazon foxed me and forces its own version of the link. Drat. Sorry about their big honking ad uglifying up your site. Lol! All good for that book! You’re the first person I’ve ever “known” who has also read it. I’ve had no one to emote to! You did a great job of saying what I would have said had I said what I wished I’d said!